I was a little surprised at the results of my inquiry as to which design the public liked the most. I had well over 100 responses which kind of blows my mind. Some people couldn't choose and 23 people just said they like them all. Some people couldn't make up their minds and chose several but here's how the numbers worked out. Number 7 was the favourite with 15 votes. Number 10 and number 14 each got 11 votes. Number 23 and number 25 each got 10 votes. Number 5 got 9 votes. Number 8, one of the designs I rejected got 8 votes. All of the others got lesser votes. 19-26 were tatted in size 30 thread so they're proportionately smaller than the others. 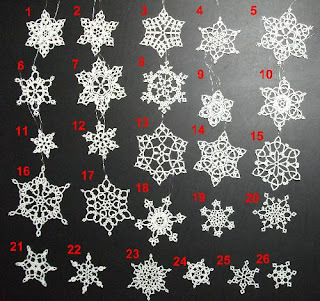 25 which was quite popular is also the simplest design being just a central ring with one row of tatting. Hope you all have fun tatting them, I sure did designing them. Thank you, Sharon! Your snowflakes are fabulous! I agree with Cindy ! Thanks for this great summery I loved going down this rabbit hole and it was fun! Thanks for the pattern too! I was trying to determine on this collage which 10 I've tatted so far and noticed that Little Flake is missing ?!! Does that take the total to 27?